← A Big Day for a 12-Year-Old: a TV Pilot, Science Fair & Magnet School! OK, I am going to start with the disclosure. I love Heckerty — and I love Heckerty’s creators, Jan Ziff and Alan Davidson. I’ve been friends with them for years, and I first heard about Heckerty on a rainy day in Vancouver more than 15 years ago. I also helped Jan write the press release pasted in below. But I am not a paid spokesman for the company. I’ve shared the Heckerty stories with my own grandkids (Aaliyah, who is now 7 and able to read them herself, and her little sister Natalia, who is just 2 and wants a cat she can call Zanzibar) and with more than three dozen other children I’ve met in waiting rooms or at social gatherings. Every one of them has been entranced. Your kids will be, too. The Heckerty stories are designed for young readers in the K-2 age range, and for pre-schoolers who start by having them read to them before moving on to read them by themselves. But older kids with special needs, especially those on the autism spectrum, seem to be just as enchanted by Heckerty as anyone else. Over and over, I’ve had parents of kids with autism tell me that their children will spend hours with the Heckerty apps, and that one of the joys of the stories is that they can be shared between siblings who do not share a diagnosis. The newest Heckerty story, Heckerty’s Valentine, is available today as an eBook. If you have kids, download it. It’s the best Valentine’s Day story ever — with an all-too-realistic look at how kids can wind up feeling when they realize that they aren’t the most popular kid in the class. But a little love saves the day for Heckerty and Zanzibar, and it’s the best valentine for kids I’ve ever see. Here’s the press release, with all the links. Happy Valentine’s Day! Download the newest eBook or order the book — thrill young fans of Heckerty, the 409-year-old witch who teaches kids values and reading skills while she keeps them spellbound with charming stories. 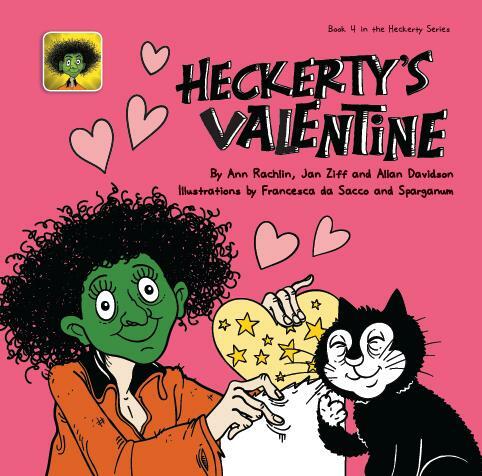 (Scottsdale, AZ – February 14, 2014) – Broomstick Productions, Inc., creators of the award-winning Heckerty stories, today released Heckerty’s Valentine, the newest title in its series of mobile apps, eBooks and printed books for children. Heckerty’s Valentine will charm preschoolers and early readers with its heart-warming tale of how a lonely witch and her cat salvaged Valentine’s Day for each other with a bit of creativity and lots of love. A print version of the story that children can enjoy offline is available from Amazon.com. The eBook is also available from the Amazon eBook store. Availability from Google and Apple will follow shortly. Heckerty’s Valentine is the third title in the popular series that’s earned rave reviews as well as reaching the #1 spot for educational apps for children in the Amazon app store The Heckerty series has also been “Recommended by Educators” on Google Play for Education.. Two previous titles – Meet Heckerty and Heckerty Cook – have developed a large international following for Heckerty and her cat Zanzibar. A fourth title (Zanzibar’s Birthday) will be released later this spring. Meet Heckerty, Heckerty Cook, and Heckerty’s Valentine are award-winning stories for children. Heckerty has appeared in children’s education for over 40 years in the UK and was created by Ann Rachlin, the internationally acclaimed storyteller, music educator, writer, recording artist, lyricist and speaker. Available first as interactive mobile apps for iPhone, iPad, Android tablets and smartphones, and the Kindle Fire eReader, the stories were released as printed books during the fourth quarter of 2013 after parents reported that their children wanted their favorite stories in a format that they could take to school and share with friends even if mom or dad’s electronics weren’t available. [Meet Heckerty and Heckerty Cook are currently available FREE on iTunes, the Amazon Android store and the Google Play store. Gallery | This entry was posted in Family and tagged autism, early reader, Heckerty, storybooks for kids, Valentine's Day, Valentine's stories for kids. Bookmark the permalink.